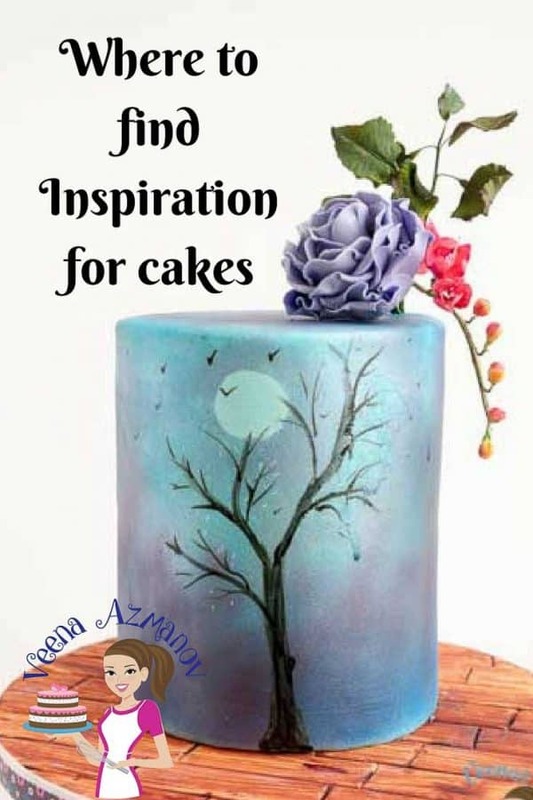 Have you ever wondered where to find inspiration for cakes? Had it happened that you have a cake to make but have no clue where start? Where to look for cake ideas? How to design a cake? What colors to use for your cakes? I hope this post will help you with some answers. Cake Inspiration – Where to find inspiration for cakes? When I started cake decorating it would embarrass to think that I had no clue how to design my cake. What’s worst is that I had some ideas in my head but no clue what to do with those ideas. At a cake consultation, I’d draw a complete blank!! Has this happened to you? If you are new then it probably has. I know some of you must feel the same way. I have this discussion with a few of you over messages. Back in 2009, I made delicious cakes! But there were not decorated. I started venturing into cake decorating and I can honestly tell you I sucked!! (well compared to today at least) But I was crazy about cake decorating. I wished so much that I could make those gorgeous cakes. So I started my career based on my passion – not talent. Of course, I had to learn from YouTube. There was no cake decorating courses here and the one that was there was so basic I already knew to use a piping bag and do some basic piping stuff. Anyway, long story short. I had to learn myself; on my own; from online and with no money to spend for tools or practice. Most of my training on the job if I took a small order from friends and family who paid me the cost of the cakes so I could decorate. I remember one of my earlier problem use to be – Creating my design. I wanted to be original and not just copy someone else’s cake. The biggest fear – what if the things I put together aren’t aesthetic. The color combination could be off, this pattern may not match. You know. Often I’d see some cake decorators do really pretty unique cakes. In groups they’d say things like – Oh there is so much inspiration around. I see cake everywhere!! Guess what? Today I do see cake everywhere! Back then I didn’t see cake anywhere, nothing looked like cake to me!! If I saw a tablecloth – it looked like a tablecloth to me. I had no clue how to vision my cake in that tablecloth. If I saw a painting – I’d know it’s a painting but – the vision of a cake in that painting? Nope – didn’t see it! Often this made me wonder if I had taken the right job as my profession. I’d always say – what good is passion without any talent. Guess what? I was wrong!! Passion is everything. It’s what got me to where I am today. In my mind, I still have a long long way to go but my passion for cake decorating helps me design the cake I do today! That’s something right? For example – Today I can see a couple of cake designs in that one tablecloth and that painting can make my mind sing cake in many ways. Yes, I come up with my own designs. I know a few of you who are going through similar dilemmas as beginners and I want to reach out and tell you – it’s OK! It’s normal to feel this way; especially in this world with so much talent pouring out. This cake was made for Cake Masters Magazine for the Queens 90th Birthday. You can read more about the inspiration here on this post – Fit for the queen. So what changed from then to now for me? Why is it that today I can see things differently? How come I can vision cake everywhere? It’s because my mind is conditioned to think cake. When I first started it was new to me and my brain was trying to process this new profession I ventured into. Everything was new! It takes time for the mind to kinda get into the groove and look at things differently. Over time I’ve worked with so much cake that brain is now saturated with cake ideas and inspiration I have been browsing all this time. Even my subconscious now has cake!! Makes sense? So you see, it’s OK that the beginning is a blur – over time you will get to a stage where you will find things get easier. When I started – like I said I did not get inspired by things around me -from pictures, posters, and movies. I would get inspired by cakes. Cakes made by others. I found that If I needed a cake – all I had to do was – go to google images and type the theme – for example castle cake – and that would help me design a new cake from scratch. I didn’t need to use any particular cake just watching those cakes would get my creative juices flowing and I’d create a design from scratch. Of course, inspired by all those techniques and colors I would see in the other cakes. When I started I use to have many folders/catalogs on my computer with cakes for different themes. I use to use them for my cake consultation. Remember above I said I’d draw a complete blank at cake consultation. Yes! I hated it – it’s like my brains would freeze. I’d feel so dumb!! But these folders would be a great help. I’d pick cakes that I think I could create and I’d show my customers just that. So that way they’d pick things I know I can do. I still do look at a lot of cakes and get inspired too, but today I like to look at real things for inspiration. like paintings, pictures of pottery, graphic design, dresses, etc. Ideally, it’s best to look at the real thing to get inspiration – why? because then you are drawing inspiration from the real thing. If you look at a cake that has already drawn inspiration from the real thing then basically you are drawing inspiration from an inspiration. And you could miss out on all the other elements that are not used on that inspiration. Make sense? Having said that – there is nothing wrong with drawing inspiration from an inspiration. I did it too! It’s what works best for you. So don’t pressure yourself to think differently. Go with the flow. 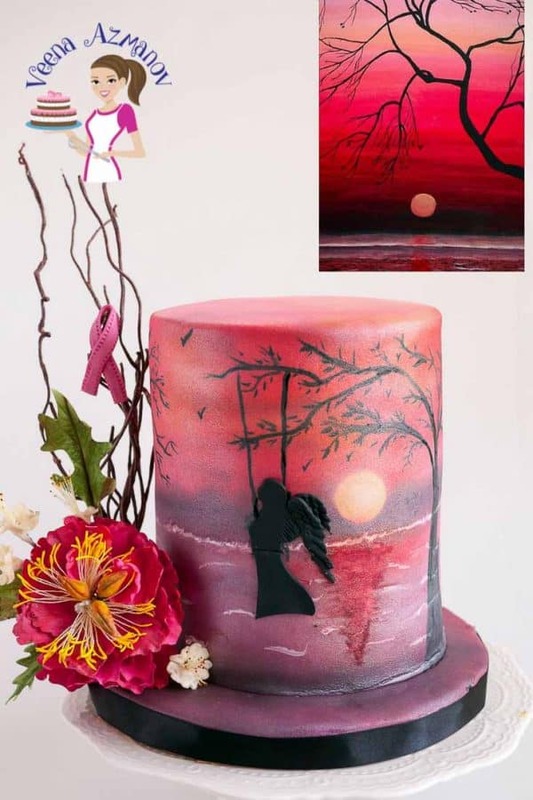 famous cake artist website and use their work as inspiration. You can go event management sites online – they post inspiration for their brides. BUT – here’s the best one for me. Today, my go-to place for inspiration is my Pinterest boards. It’s free!! For me, it’s similar to those many folders/catalogs (I mentioned above) I use to have for inspiration but instead of having them on my computer I now have them in boards in my Pinterest account. What’s best is that you can share these inspirations with everyone which is even more inspiring. And you can follow people whose work inspires you so you can see what inspires them. You get to see what they have pinned for inspiration. So basically it’s a place that you can collect information that you may need in future. Ever had this thought come to you? Oh, I remember I saw that cake tutorial – don’t know where? Guess what? if you pinned it to your Cake Tutorial board on Pinterest, all you have to do is look in the board. Oh I know Veena has this recipe on her blog – but I cannot find it now!! Guess what again – If you follow Veena Azmanov on Pinterest all you have to do is go to her boards and it’s right there. You can click on that Pin to go to the tutorial or you can re-pin it to your board for future. You can even create Private Boards for those personal Pins you don’t want others to see – for example, I have my wishlist of things I’d like to buy on a private board. Sometimes you just like to keep things for yourself. How I use Pinterest and how it helps me with inspiration for cakes. The best way to explain this is of course by showing you my own Pinterest account. When you get a chance I’d like to invite you to visit my account on Pinterest. You will have to create an account if you don’t already have one (it’s Free and totally worth it – trust me) Follow me if you like then browse thru to see what boards I have. Go ahead click them and see what I have pinned on them. This will give you an idea of how I use them. My stuff – My Blog Recipes, My blog Cake Tutorials, My Videos, My Cakes – so people can find and repin my stuff for their future use. Cake – lots of boards related to cake ideas, cake inspirations and cake tutorials from around the web. Food – boards related to food recipes – breakfast, appetizers, meals etc. all pinned from around the web. 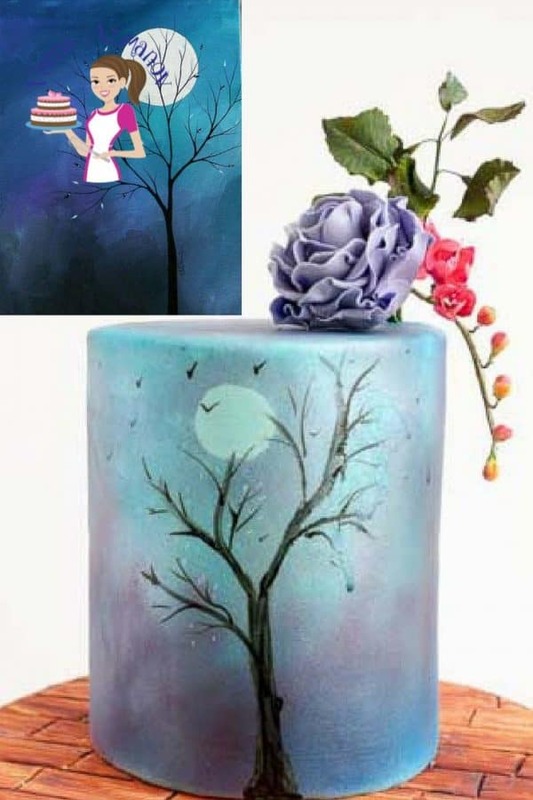 and Cake Inspiration -Art inspired – Lots of artwork to inspire me. also, Cake Inspiration – Color Combination to help me figure out which colors go well together. Cake Ideas – and you will see my boards for kids cakes, castles, and Princess, Weddings, Steampunk etc..– more than 1000 cakes I have pinned over time. I use them to stimulate my mind to create new ideas and to keep my cake sanity if you know what I mean. You can pin cakes from sites like – The Knot, Martha Stewart Weddings, Online Magazines etc… These are a great inspiration. My cakes – If someone is looking for my cakes – they can see them on this board. They can re-pin them too! Just to drive the message home – Do you remember this cake. My Pink Sunset for the Cancer Collaboration? I have a few painting in my board- Paintings I like and you will see I have a few pictures there that inspired this. I even use Pinterest for my cake consultations. Yes, I do? Often my cakes are ordered from overseas which means the bride is discussing her cake in the email. In this case, when I ask the bride – what design she wants for her wedding? If she has any ideas? What is her theme? Color combinations? Sometimes they only have ideas of colors, a concept but find it hard to vision a cake. In this case, I will send her links to the painting, cake or color chart to refer to. It’s often better to let her see the color chart than me saying blue and not knowing what shade of blue we are talking about. Often I will create a private board just for her and let her join me on that board so she can be pinned things she likes. This helps us discuss ideas that would have otherwise been only possible only across the table. So you see Pinterest has replaced those folders/catalogs from my computer to an online site. I love Pinterest cause its’ now so easy to keep things organized – I don’t have to search. I can follow people whose work inspired me, get notified when they upload a new cake so I can re-pin it to my own board for inspiration. 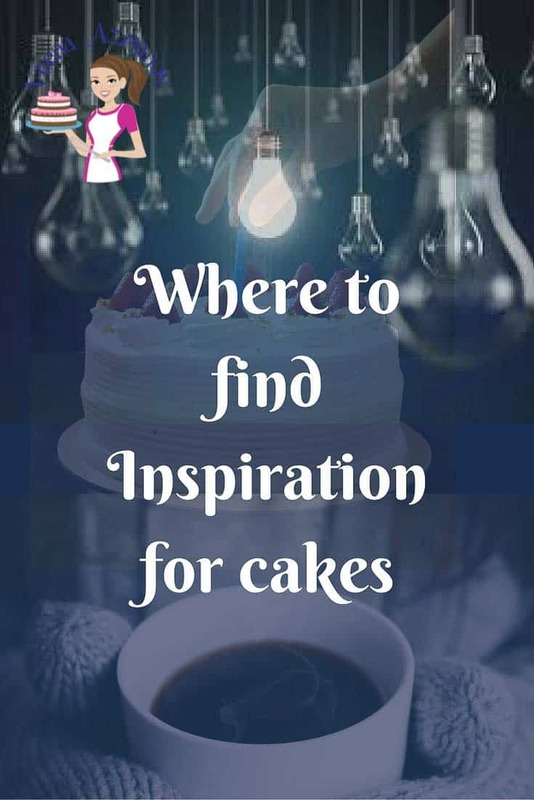 Remember this post is about where to find inspiration for cakes not how to use your inspiration. Perhaps we will do that on another post on how to use inspiration for cakes as well. If it is something you like, let me know and I will add that to my list for a future post. For now, I do hope I have given you beginners a little relief and also given you a place to not just search inspiration but store things that you love. Wish you all Happy Caking. 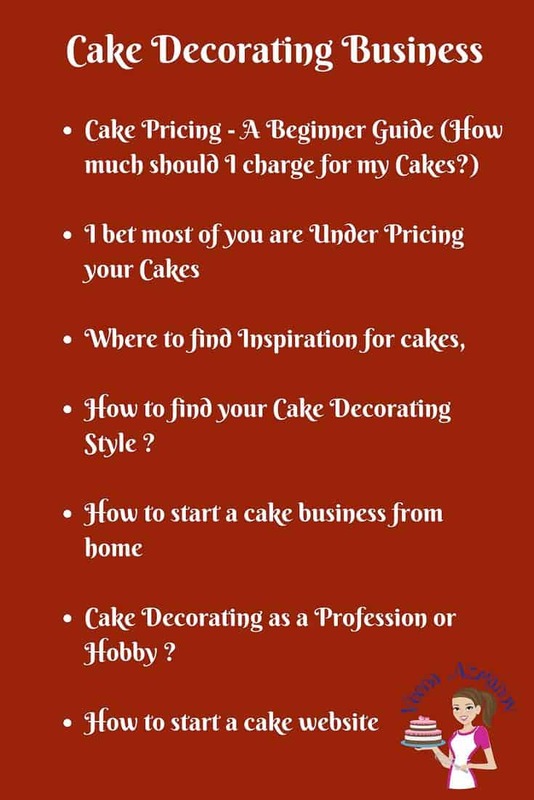 Are you into cake decorating – you may like to see more business post. I love this Veena! I feel so similar – when I started out, I just looked at cakes, and now I really do see inspiration everywhere. It just took some time. I love gift wrap, wallpaper, clothing (especially funky kids tops), postcards, greetings cards, art, and even promo material from films and tv! 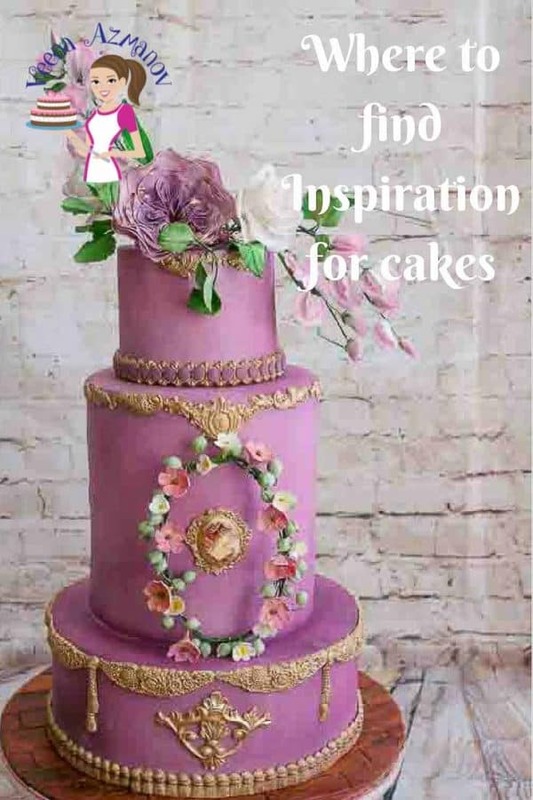 I hardly ever use actual cakes for inspiration any more…. Thank you Liz. So happy to hear that..!! I think most beginners don’t realized that it’s normal to feel like that. Thanks for sharing and your lovely comment.